Footage of a horrific slaughter of a black bear has been circulating online, and it’s not for the faint of heart. 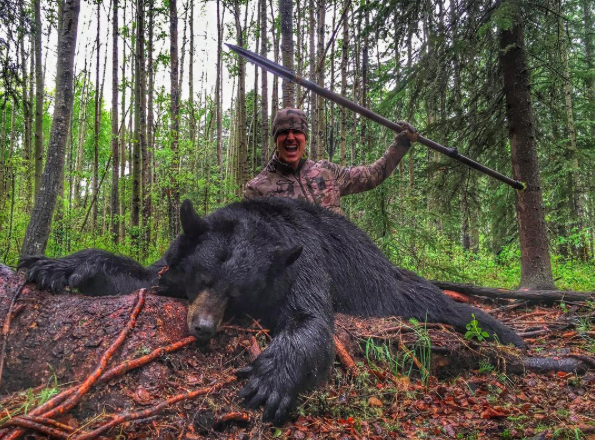 Filmed in Alberta, Canada, the disturbing video shows American hunter Josh Bowmar slaughtering the wild animal with a 7ft homemade spear – causing it to suffer a slow death. Bowmar’s 13-minute film shows the moment the animal is hit and its intestines ripped out as the spear, stuck in its body, hits a tree as the bear runs away. The clip also shows the hunter, from Ohio, lifting up the animal’s dead body while its intestines pour out of its stomach. Animal rights campaigners said the bear could have taken up to 20 hours to die. The slaughter, which has even appalled fellow big-game hunters, has been viewed more than 195,500 times on YouTube. The bear was left to roam while suffering harrowing injuries, much like Cecil the lion, killed by U.S. dentist Walter Palmer last year. It was not until the next day that Bowmar found the body of the bear, which was estimated to have weighed more than 28 stone and measured at 7ft 1in, in the forest. I’ve been hunting for 56 years and this video was disgusting. It’s mindless jackasses like this performing shameless ‘stunts’ that attempt to glorify the hunter, but by doing so demean the game animal, that give all the anti-hunters the arguments they need to hate us. Shameful spectacle of pseudo bravado. Stop focusing on yourself and show some respect for the animal. If you want to take an animal humanely (which you obviously could care less about) then shoot it with a rifle. Here’s to hoping Bowmar sees all the criticism and thinks twice before subjecting another animal to a slow and painful death.